We are now offering granite fire pits starting at $300.00 each. Call now for more information! There are many homeowners who have incorporated granite into their kitchens, bathrooms, and other areas of their homes. But did you know that it can also add a little something extra to your backyard when you order a custom granite fire pit? Granite outdoor fire pits look beautiful, and they are built to last. Allow MC Granite Countertops to show you the wide range of styles they have to offer in Atlanta, or enlist their help to customize one that fits your backyard space perfectly. You and your family will revel in the lifestyle that comes along with backyard entertaining, and you will quickly see why a granite fire pit in particular is such a great investment. MC Granite Countertops creates a number of products that utilize beautiful granite, marble, quartz, quartzite, and soapstone. The company, which is located in Kennesaw, GA but serves Atlanta and the surrounding cities, specializes in providing the latest in granite technology, including water jet cutting, CNC fabrication, and digital measurements. This advanced technology can be used to create custom granite fire pits that meet your needs. Sure, there are many different kinds of outdoor fire pits on the market, but a custom granite fire pit is one of the best money can buy as it is durable and made exactly how you want it. You’ll love cozying up on enjoyable nights in front of your new granite fire pit! If you have been thinking about adding a granite fire pit to your backyard, now is an excellent time to do it. 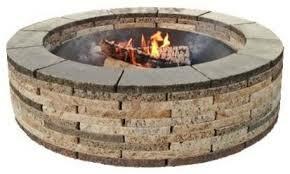 MC Granite Countertops will happily help you to create a fire pit you will love. Call 770-833-8075 today to find out more about their custom granite fire pits.